TTN 9th February 2016: The waterside restaurant location of the collapsed Milano’s restaurant at Pelican is on the cusp of federal, state and council electoral division. 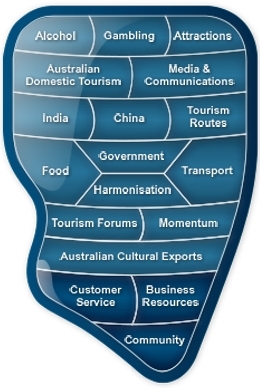 Like many key tourism jurisdictions, especially those on waterfront or on protected lands, the administration of property is allowed to fall through the cracks of departments and local government areas, making it extremely difficult for tourism operators to provide for their guests. 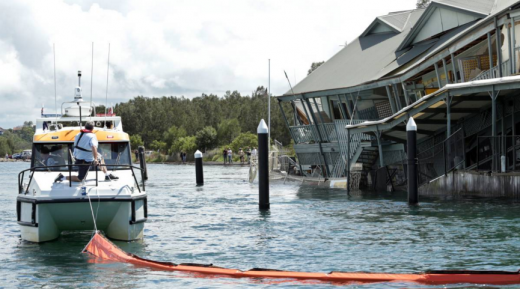 POPULAR Pelican restaurant Milano’s On the Lake has partially collapsed into Lake Macquarie. Police were called to Pelican Marina on Soldiers Road about 9.30am on Monday after police received reports of a building collapse. Officers arrived to find a portion of the marina had given way and fallen into Lake Macquarie. Two people were inside the marina at the time, but were not injuried. The collapsed building houses well-known restaurant Milano’s, as well as an accountant and boat business. Several units are above the restaurant. One female resident told emergency services she heard a loud bang before seeing her walls cracking. She was able to clamber out uninjured and was being comforted at the scene. Superintendent Brett Davis, from Fire & Rescue New South Wales, said crews had found the structure had suffered “severe structural faults” and it appeared the piers underneath the front of the building had “given way”. “The piers have gone from underneath the structure,” Mr Davies said. “We can’t get in there to have a look to see how many piers have gone that’s why we’re really restricting access to the premises. Fire and Rescue NSW has isolated electricity, gas and water to the site and marine rescue has installed booms in the water to ensure no contaminants pollute the lake. Mr Davies said Public Works structural engineers were also at the site to assess the structural integrity of the building. Builders are installing protective barrier fencing around the site. “The floor from the first floor is actually into the lake itself, so unfortunately we won’t be allowing anyone into the structure to obtain any goods or any of their items,” Mr Davies said. “We’ll be working with the Salvation Army for the welfare of these people. “If you saw the amount of damage inside – there’s residents up there on first floor – it’s very very lucky people were not seriously injured if not killed. Mr Davies said structural engineers would determine the future of the site and would consider whether it needed to be demolished. “That would appear to be the only option due the amount of damage, it would probably have to be demolished,” he said. Mr Davies said the restaurant owners were “distraught”. “It’s their livelihood,’’ he said. “At the moment we’re trying to assist them as much we can to minimize the concern they have.”. Jim Sommers, who ran boating company Marine Sale Solutions on the ground floor, said he had only left the marina 20 minutes before the collapse. Mr Sommers said Crown Lands had taken over the running of the marina in December. He said there was an inspection done on the marina in December. “Some of the pylons were being held by ratchet straps,” Mr Sommers said. Crown Lands Hunter manager Tim Deverell said the department “initiated forfeiture” from the company leasing the marina, Elidock Pty Ltd, “for various reasons, including failure to pay rent” on December 4. “The department had a structural assessment report done before Christmas, once we took possession, which we identified some urgent matters that needed to be done such as electrical and fencing which we have replaced,” Mr Deverell said. Former leasee Ben Ensor said his company Elidock Pty Ltd had paid $1.4 million for the Crown Lands’ lease in 2011. He said he was forced to spend tens of thousands of dollars of his own money repairing piers around the building over the past five years. He starting withholding rent following a breakdown with the Department of Crown Lands over what should be done to rectify the problem. “Some rent was withheld on occasions as a partial offset against damages,” Mr Ensor said.